The lighting fixtures and lamps you choose for your home are an essential component of your decorating style. Lighting fixtures also significantly impact each room’s utility. Choose lighting fixtures and lamps based on what kind of light you need in each room. Daylight spectrum lights are best for the bathroom, where grooming takes place. Fixtures that provide bright overhead light are best for the kitchen, while bedrooms and family rooms benefit most from a mixture of task and overhead lights, so you can change the mood and function of the rooms as needed. In the bathroom, choose bulbs that give off daylight spectrum light. Many people like back-lit mirrors or classical wall sconces for a soothing ambient glow in the bath. Recessed lighting also makes this space look inviting. A bathroom vanity, however, should be well-lit with daylight spectrum light from both sides and above, so that you don’t have shadows falling across your face while you’re shaving or putting on makeup. Track lights and pot lights are excellent choices for kitchens, where you need lots of bright ambient light to see what you’re doing. This is where your family and your guests will spend the majority of time, so it’s also where your lighting and décor will need to really stand out and express your personal tastes. In the living room, it’s best to use both lighting fixtures and lamps so that there’s a good mix of task lighting for everyday use and ambient overhead lighting when you want it. When choosing task lighting for your living room, a good rule of thumb is to place a lamp at each seat wherever possible. Floor lamps are a good lighting solution for areas where you don’t have a table to place a smaller lamp. Place floor lamps in corners or along the wall, so no one trips over them. End tables are good places for smaller lamps. Wall sconces look elegant and don’t require floor or table space. They’re a great lighting solution over the sofa or in other areas where a table or floor lamp will be impractical. For overhead lighting in the living room, consider a hanging fixture. Pendant lights and chandeliers look classy, as long as you have high ceilings — you don’t want guests bumping their heads. To choose a chandelier, figure out the dimensions of the room in feet and add those two numbers together — that’s how many inches in diameter your chandelier should be. If the design is chunky and heavy, buy a slightly smaller one; if it’s light and airy, you can get away with a slightly larger one. Add a dimmer switch to your overhead living room lights so you can change the mood of the room as needed. A flush mount or semi-flush mount overhead light is a subdued choice for a bedroom, where over-the-bed wall sconces, table lamps, and floor lamps can also provide reading light and improve the atmosphere. A dimmer switch is also an excellent choice in this room, where you want to have control over the mood of the lighting. Most lamps come with lampshades, of course, but buying a new one is a good way to spruce up an old lamp or totally change the look of your room. A lampshade should be three-quarters as tall as the base, and should come down just past the lamp switch. 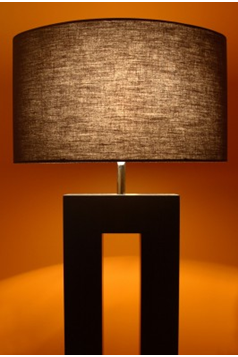 The widest part of the lampshade should be wider than the widest part of the base. There should be at least two inches between the bulb and the shade to prevent fires. If your lamp base is plain, consider an elaborate shade; if it’s ornate, buy a simple shade. Choose a style that compliments your existing décor. When buying a lampshade, think about how much light you’ll need from the lamp. Will it be a reading lamp? Buy a shade with a wide base. Do you want the shade to diffuse a lot of light? Buy one in a light-colored fabric. Do you want a dim light? Buy a dark-colored shade. Choosing lighting and light fixtures for your home can be overwhelming, but it doesn’t have to be. Consider the function of each room and choose lighting that enhances it. Use lamps, lampshades and light fixtures as an opportunity to express your personal sense of style. About the Author: Contributing blogger Ellen Flanagan is a Certified Interior Decorator living in Washington, D.C. She personally recommends maxim lighting for its wide selection of lighting styles to fit all budgets.